Hey there, two days in the middle of the week. What's that? You have nothing to do? Not working? I know. Lets drive 6 hours to Arizona to watch the Dodgers! How about we wake up at 4 am in order to make the opening day of Spring Training. ROAD TRIP! At an Arizona rest stop. Be careful where you pee. So this probably wasn't the best for my sleep wake cycle, but what the heck. Mrs. Cora was on board, so there is no turning back. We packed up the car and headed out to Glendale Arizona. Since I was so late to make plans, all of the good hotels around Glendale were booked, so we stayed in Peoria, which actually wasn't that bad and only a 10 min drive from Glendale. We made it to Salt River Field in Talking Stick Arizona (home of the Dbacks and Rockies) right before game time. The traffic into the stadium reminded me of Dodger Stadium. It was really crowded and not well organized. Plus parking was 5 bucks (free at Camelback). But we made it to the gate and bought some lawn tickets. It was kind of overcast, which was good, because it is damn hot in Arizona. I have never sat in the lawn section (the only tickets available), but it was great. Especially after that long drive, it was nice to lay back and stretch out the legs. The stadium is nice and apparently configured by the same architectural firm as Camelback Ranch. However the hot dog and fries were DISGUSTING. Nonetheless, I had a great time watching the first game of the season, despite the loss. After the game, Steve Yeager was down in the bullpen and he kindly autographed a baseball for me. Disgusting food. Fries where horrible. Is this where he got hurt? 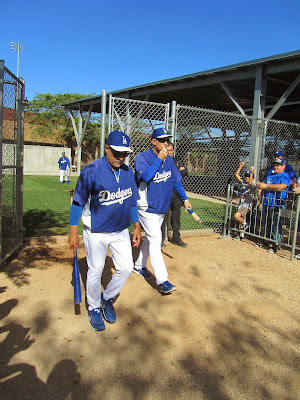 The next day, we woke up bright and early to get to Camelback Ranch just after it opened. Of course there were a whole bunch of people there already, especially autograph seekers. It was nice to be surrounded by a bunch of loyal Dodger fans. In fact, SOSG reader "Chad Beardingsly" recognized my SOSG shirt and kindly stopped to say hello. The players and coaches hit the practice fields early. 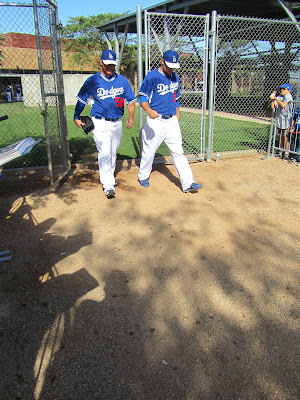 My impressions on watching the players was that Josh Beckett had some real zip on the ball during the bullpen sessions. Paul Maholm on the other had didn't, but could have been working on off speed stuff. I actually thought Alex Guerrero looked pretty strong at second base. Like everyone else, I am excited to see what comes out of the competition during spring training and the rest of the year. 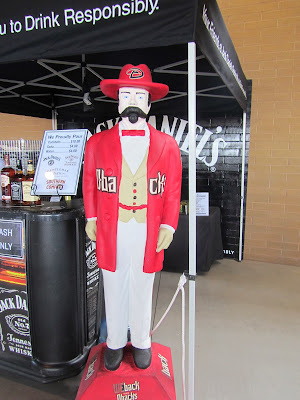 The second game of the season against the DBacks at Camelback Ranch was a little slow, but at least we won. It also might have been more palatable because we bought seats in the shade behind home plate. I didn't think that Juan Uribe's home run was going to go over the fence. I was only imagining Charley Steiner's crazy call in my head. It was also neat to see Guerrero go 2 for 4 and see him collect his first major league hit and RBI. The other highlight was seeing Team Killeen in the house, BJ armed with pen and paper and Scott armed with a humongous camera lens. Because of the impending rain and the fact that I had to work really early on Saturday, we decided to stop by Camelback Ranch for only a couple of hours before heading home. There seemed to be less people in the morning, but started to get crowded by the time we left at 10 am. We did sneak over to the White Sox fields where there were far less fans there. We seemed to get closer to the field and actually sat down and watched them train. Also, you can snag a foul or home run ball when they take batting practice. Alas, we had to leave Blue Heaven in Arizona, and jumped in the car for the long drive back. The drive back was pretty bad too since there were so many accidents due to the rain. It took us about 8 hours to get back because of all of the detours we had to make. But we made it and it was a fun trip to cram into the week. Below are some more pictures I took. Enjoy! GO BLUE! Donnie mobbed by reporters. Where are you BJ? Nice job reporting. Next time you get the press pass! Nah, then I can't act like a 12 year old kid and totally embarrass Mrs Cora when I ask for autographs. Did you get anything good on the other side of the rope? Scott got Sunday pass, but I got Mota and Nando's autographs on my hat! !